There&apos;s already a documentary about "Batkid" titled Batkid Begins: The Wish Heard Around the World. Now the story of Miles Teller, the 5-year-old cancer patient who got to live out his dream of teaming up with Batman, is being made into a Hollywood feature starring Julia Roberts. Roberts is also set to produce the movie through her production company, Red Om Films, which bought the rights to remake the documentary premiering at this weekend&apos;s Slamdance film festival into a scripted film. 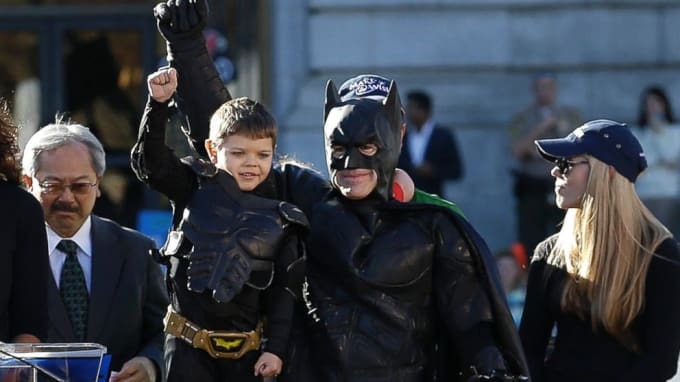 If you don&apos;t remember the story of Batkid, you may have been in a coma in 2013. The Make-A-Wish event literally spawned a billion social media posts, including a Tweet from actual Batman. Here&apos;s the trailer for Batkid Begins, which premieres this weekend at the Slamdance film fest.